Build your business and make the most of your Chamber membership by getting involved. 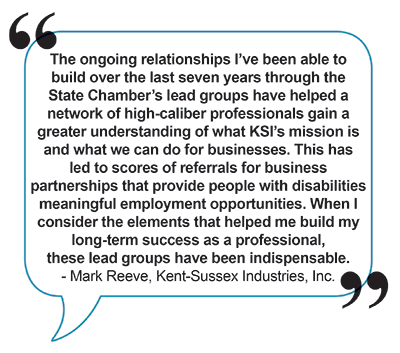 The State Chamber’s Lead Groups help companies grow through networking and referrals – the most productive form of business prospecting. 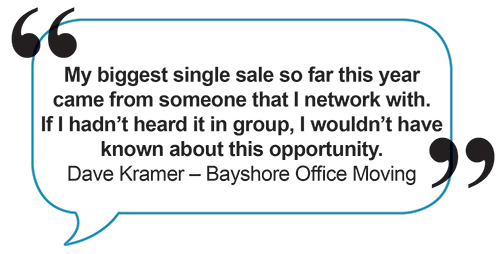 The groups meet twice a month to share business news, warm leads, and personal referrals. Each group is limited to one representative of any given business category. That is, no competitors to inhibit the sharing of leads and market information. Wilmington 1: Meets on the 1st & 3rd Fridays of the month in the Board Room of the State Chamber at 1201 N. Orange St. 8:15 am to 9:15 am. For more information, contact Ken Evans at 302-576-6576. Wilmington 2: Meets on the 2nd & 4th Fridays of the month in the Board Room of the State Chamber at 1201 N. Orange St. 8:30 am to 9:30 am. For more information, contact Chuck James at 302-576-6562. Newark: Meets on the 2nd & 4th Tuesdays of the month at the Perkins Student Center, located at 325 Academy St., Newark, DE 19716. 8:30 am to 9:30 am. For more information, contact Chuck James at 302-576-6562.